Brand purpose: Should brands have a purpose? We’re living in tumultuous times. Extreme weather events demonstrate climate change is no longer a looming global threat, but one that’s very much upon us. One in seven people around the world are hungry, yet a third of food is wasted. Seventy percent of the world’s population holds only three percent of the global wealth. It is getting harder to hide our heads in the sand, to be willfully ignorant of the negative effects of climate change, war, poverty, hunger, and social inequality. Spurred by the growing roar of public outcry, more and more public figures are putting aside ideologies and partisan differences to acknowledge the threats that humanity faces. Acknowledgement is important, but it is only the first step. Change necessitates action. Realizing we can’t rely solely on government, nonprofits, and NGOs to solve all of the issues impacting society and the environment, corporations are stepping up to play a critical role in building a more prosperous economy. Global brands like Ben & Jerry’s, Tesla and REI, are among the thousands of companies placing “social” at the forefront of their enterprise – putting purpose alongside, or even ahead of profit. Cutting checks and traditional philanthropy is no longer enough; it’s about creating systemic and meaningful change. Corporations have more economic equity than ever — it’s time they put it to good use. 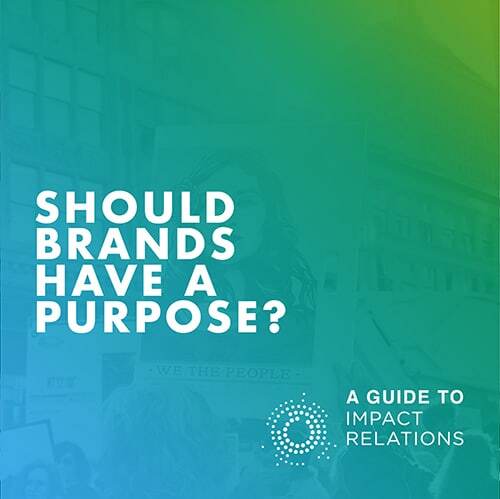 Interested to learn more about building a brand purpose strategy? More here.